1. NETWORKING IS A LONG-TERM ACTIVITY. Networking is not something you can start today and expect results by the evening. It is a long-term activity where the best results can come months or even years after your initial effort. And it's not something you can buy ready made, since every network is personal. To build a solid network takes time and effort and the sooner you start this effort the sooner you will have the benefits. 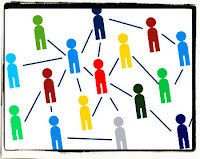 If you start building a network today when maybe you are not looking for work that network will help you a few years into the future when you decide to change or someone else decides for you. In the social media course I teach each year at the IAE Aix Graduate School of Management I am pretty sure that I have never once mentioned Abba, the iconic Swedish pop group that peaked in the 1970s before my students were born. But this year I will be adding a case study about the interesting way that their new museum in Stockholm connects interactive exhibits so that visitors can save and share to social media their experiences. I visited Abba The Museum and interviewed CEO Mattias Hansson in early April, researching an article for Eye for Travel -- Mamma Mia: Look What Happens When a Museum Harnesses Social Media. At the time the museum was still in construction but already it was clear that this is going to be a cutting edge development and an inspiration for other museums and attractions.